I have a little confession. I had been unfaithful. And we did it in Figaro Coffee shop. Before you even call me names. I have to be clear - this has nothing to do with an individual, a lover or a man or woman. I felt that I had been unfaithful to the coffee shop brand I was working for years ago. It is an expectation that one should stay loyal by promoting and patronizing the products and the brand which logo's emblazoned in your uniform. But it was difficult to hate a good brand which also offers really good drinks and promotes local products. So, at times I would find myself indulging with a cup of hot chocolate (yes, I usually just order hot chocolate, because I considered drinking another coffee brand an ultimate sin).. But then again, you can call that market research, you know, that kind when you go to a competitive store just to observe and back to your own barracks, you conceptualize and think of ways how to win the coffee battle. At that time, I felt like Figaro Coffee was like Angelina Jolie. I simply just love to hate the brand (just because it is a competitor), but deep inside I know there is so much to love about it. Figaro Coffee offers not just coffee, tea, pasta, pizza, sandwiches, breakfast sets and even rice meals. 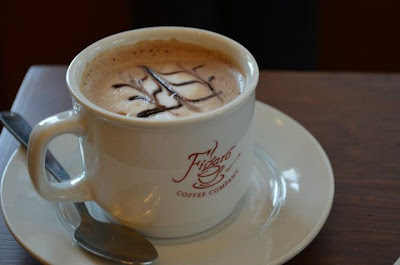 Clearly, Figaro is not just the coffee shop you go to in the morning, but in any time of the day and in any occasion. On its 20th year (yes, Figaro has been in the industry for 20 years! I remember only smelling its fresh brew from the Robinson's Place Manila store), Figaro Coffee is extending the holidays until February 25, 2014 with its All You Can Eat Pasta and Sandwich Promo running from 6PM to 9PM at selected branches. Click Read More to know more about the promo.. Okay, so I never realized that pasta and sandwich pairing is that challenging. To be fair, the Tuna Pasta (Al Tonno) goes well with the Grilled Chicken Sandwich. Not a lot of coffee shops offer Al Tonno pasta, so you might want to order it from Figaro Coffee. The serving is just half of the regular pasta and sandwich serving, BUT don't fret - as you can always ask for a second serving. The usual All-You-Can-Eat rule applies, foodless plate first before ordering for a second plate. The set also comes with bottomless Lemonade (which is really refreshing). I usually just have water (as I do not drink soda or sweet juices), but I enjoyed the Lemonade because it is not sweet - unlike Iced Tea which is mostly tied with set promos. I love our Arrabiata and Tuna and Cheese set because I love tomatoes and red sauce. Figaro Coffee ensures that they are serving quality food with this promo - the sandwich is served warm, greens are fresh and of the same standards when ordering ala carte. For those who love white sauce.. TADAH! So, if you guys are planning a dinner date, get-together with friends, or family reunions, try the Figaro All-You-Can-Eat Promo. For only Php299 per pax, you can try different pasta and sandwiches (imagine you can taste all the sandwiches and pasta offerings in the menu - that is if you are still not filling full after the second plate!). It comes with bottomless Lemonade. Promo runs until February 25, 2013 Monday to Friday from 6PM to 9PM. Figaro Alabang Town Center, Figaro Banawe, Figaro Cattleya, Figaro DBP, Figaro Glorietta, Figaro Greenbelt, Figaro Shangri-la, Figaro Festival Mall, Figaro Gateway Mall, Figaro Liberty, Figaro Tomas Morato and Figaro BPI Medical Plaza. Hungry yet? Planning a date? The pasta and sandwiches choices are healthier, so you can eat with less guilt when you order for a second or third plate. As for me being guilty, I am not. I just love good food, and good coffee - and good promos.